The Mitsubishi SAF1000E7 ventilation and heat exchanger is the largest model of heat exchanger in the SAF unit’s line up. Modern building regulations require losses to minimised when ventilation is required. This unit captures warm air leaving the building and recycles the warm air to heat the incoming air used for ventilation of the premises in winter. 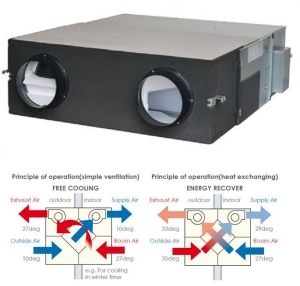 Likewise in summer the exhausted air can be used to cool the incoming air to the building hence saving in air conditioning costs. The Mitsubishi SAF1000E7 model is suitable for larger sized premises with a 1000 cubic metres per hour flow rate.